Welcome to our Thanksgiving Blog Hop. We are a group of crafty blog friends who like to get together and share crafty ideas. We're using products we like to make projects we enjoy making. Thanks for stopping by and be sure to visit the blogs of the other ladies participating in our Thanksgiving Blog Hop today - I've listed their names and links to their blogs at the bottom of this post. My card uses all Tim Holtz products except the sentiment. The sentiment is a stamp I love from The Unity Stamp Company. I used some distress crackle paints and stains on the grunge paper leaves and experimented with different colors. I had so many leaves that I ended up making 2 cards. Be sure to check out Tim's Blog to learn about his different techniques. Very pretty cards! 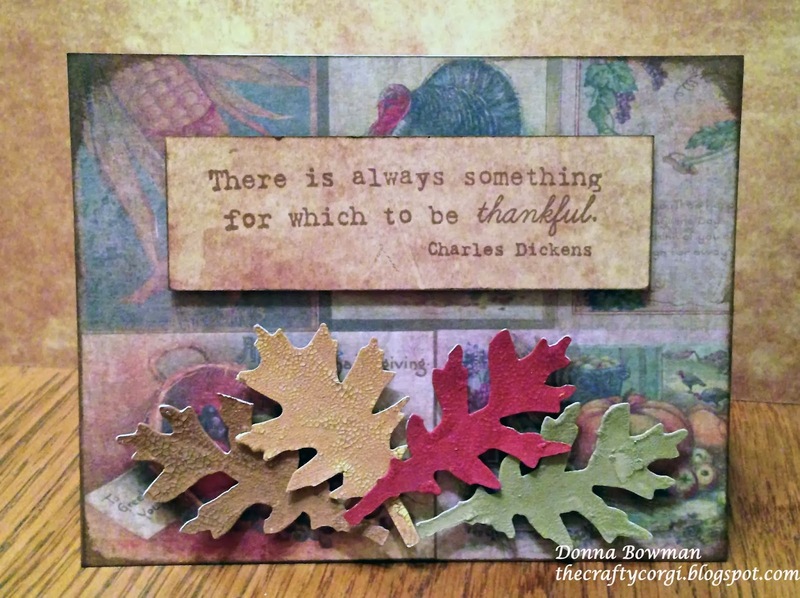 I love the various colors you have created for your leaves and the backgrounds you have used. oh my Donna this is gorgeous.. i totally love it..
WOW, you've showcased your flair with Tim's techniques beautifully! 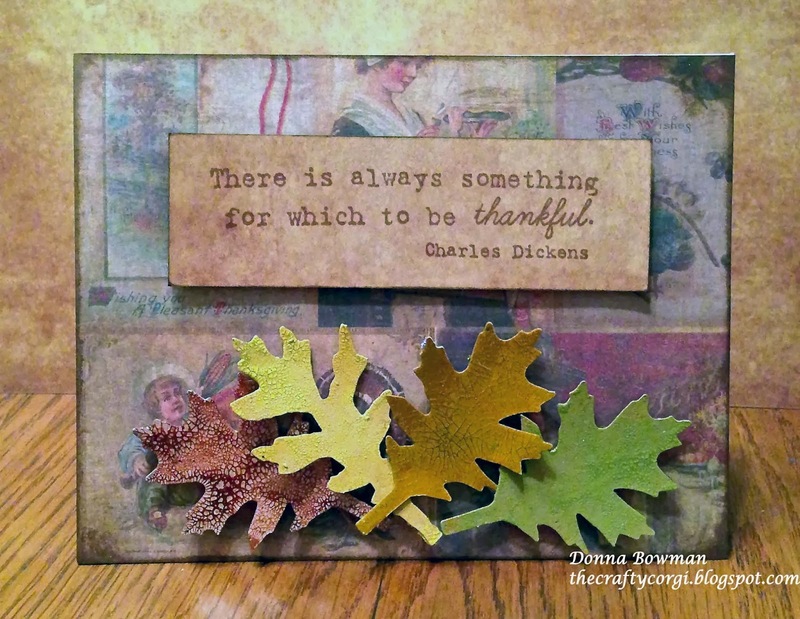 Gorgeous card with those beautiful leaves and yes, the perfect sentiment, indeed! Love the soft, pretty colors on your card. Love the beautiful fall colors! Great cards. I like how you made the leaves. These are so gorgeous Donna! So pretty! I love the soft background and those leaves are gorgeous! oooh, love all the colored leaves! We don't really get the fabulous leaf changes here where I live so I try to live vicariously! Beautiful fall card Donna. I'm digging all the colors...LOVE those leaves!!! Stunning creations Donna! Nice to see that you put the extra leaves to great use on a second card...they truly deserve a spot in the limelight! 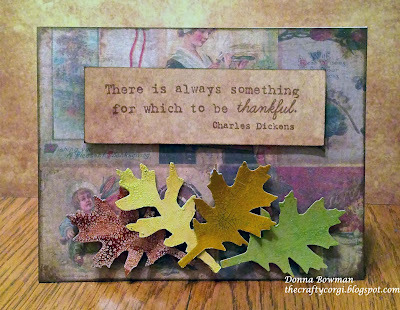 I love the depth that you have created by layering the leaves (amazing colors by the way) on your card. One look at your card and I'm quite sure that I can almost smell the cool, crisp fall time air!